Join E-Democracy’s 2013 Inclusive Forum Engagement Team! was written on March 19, 2013 and filed in All, Inclusion, Minnesota, Neighbor Neighbourhoods, New Efforts, St. Paul - US. 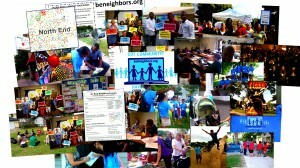 « « New Volunteer Orientation – Love your neighborhood? Want to help it from the comfort of your own home? MAR 19 UPDATE: Applications are coming in, but we need your help to spread the word in particular in the Latino and African-American communities. We believe in building strong, inclusive and connected neighborhoods. This can happen in many ways like having great public spaces such as playgrounds and trails decorated with public art. This can also happen by creating opportunities for all neighbors to be able to connect with one another and build the kind of community in which they want to live. Our Neighbors Forums are online spaces where neighbors connect with one another, learn about local events, ideas, or issues they can be involved in and build real community. In Saint Paul, we already have over 7,000 diverse forum members across 17 active online forums focused on different parts of the city. We are looking for passionate community builders in Saint Paul who are highly skilled in communications and community organizing, and are strongly connected to their cultural communities. We have four contract ~5 hours a week positions for individuals who are interested in bringing these Neighbors Forums to life with community content and dialogue reflecting the great diversity of our neighborhoods. National statistics on neighbor connecting online demonstrate a huge income gap and some dramatic ethnic gaps in terms of participation. We expressly seek to address that problem by building online and in-person bridges among neighbors from ALL cultural communities as well as immigrants and lower income residents. E-Democracy has additional team members involved with general outreach to all community members. We seek resumes and letters of interest from those who can help us pave the way for multicultural dialogue in these communities. Context: Your efforts will be supported by initial training and regular team meetings, coordinated engagement strategies and activities, and shared lessons in inclusive online engagement and digital technologies. You will work closely with other E-Democracy contractors and volunteers to develop, refine, and further the goals of the inclusive online engagement campaign. Scope: The Inclusive Community Engagement Online project is primarily focused on the lower income, higher immigrant, and/or highly diverse neighborhoods of Saint Paul, but opportunities can include events and activities throughout Saint Paul as well as in other Twin Cities communities. Intentional content seeding: Join targeted Neighbors Forums as assigned and post information relevant to the cultural communities with significant populations within the forums. Attend community events and share short stories/summaries of the event with photos (with permission) or short YouTube videos; training will be provided. Monitor ethnic press and cultural organization websites and share links to important news and information with the Neighbors Forums with a local connection. Knowledge about Google News Alerts and monitoring web feeds will be useful. Meet with and train cultural organizations and community groups on how to join, post, and generally use the forums to reach out to the community; provide ongoing coaching and support to organization staff, as needed. Build transferable relationships with community organization leaders and staff. Identify and build relationships with diverse forum members initiating conversations to mentor/coach inclusive forum engagement and provide support for overcoming barriers to participation. Identify and promote intentional online discussion topics to promote digital storytelling about community life experiences and happenings across the community. Collaborate with other E-Democracy contractors to provide digital capacity building training/tools to the community. Encourage diverse community members to join area forums of interest. Help the community feel empowered to raise their voices by recruiting volunteers to help build community in their neighborhoods via the forums. Secondary Activities: Additional activities include field outreach, grassroots organizing, team communications and reporting, project evaluation and lesson sharing. More information will be provided. Highly values personal accountability and reliability. Can meet deadlines and manage multiple tasks in a fast-paced environment. Excellent written communication skills, preferably with a background in or experience with journalism. Effective communicator. Values and fosters open communication; uses and understands the importance of active listening skills and is an effective public speaker. Bilingual in one of the many languages spoken in Saint Paul, such as Spanish, Somali, or Hmong, and able to connect as a liaison with your primary cultural community. Deep connections to the targeted communities, including involvement in neighborhood, community, or cultural organizations. Applicants with both deep Saint Paul and cultural community connections are strongly encouraged to apply. Residency is not required, but regular and consistent connections to Saint Paul are a preferred. Passionate and enthusiastic; positive outlook and willing to lead. Inspires others to do high-quality work. Deeply believes in the power of community building. Field outreach or organizing in diverse communities (tabling, door knocking, etc.). Proficiency with online technologies, including online forums/social networking, Google Apps, social media, and digital cameras/video devices, uploading video to YouTube, etc., preferred. Time Commitment: 200 hours from April through December 2013 averaging 5 hours / week over the course of 38 weeks. Contractors must be reliable and able to work on a flexible schedule. Rate: $15.00/hour. As an independent contractor, you are responsible for all of your own Federal, State, Social Security taxes, and any insurance you choose to carry. To Apply: Send a statement of interest describing your qualifications and resume with three references to team@e-democracy.org. Use the subject line: Inclusive Engagement Leader Application. Be sure to include any relevant work samples and/or links to online content you’ve generated (blog posts, articles, digital media, etc.). Include any questions in your email. No calls please. Deadline for Applications: We are looking for applications NOW and are conducting interviews in March. However, these positions will remain open until the people with the right skills, community connections, and time availability are found. To apply after March 25, email team@e-democracy.org to ask if there are still openings. Add a comment to the blog post Join E-Democracy’s 2013 Inclusive Forum Engagement Team!